Every now and again, a cookbook comes down the pike that captures my attention with gorgeous photos and mouthwatering recipes, proving itself to be pretty damn special. The return is even more special when it happens to be a friend that writes such said cookbook. My sweet friend, Charmian, released her cookbook The Messy Baker last month and kids, it's incredible. My foodie girls, Robyn and Christina, and I were lucky enough to sample few of her treats at a book launch party last month. The Blueberry-Lime Cornmeal Muffins with Whipped Honey-Lime Butter totally did me in, as did the Double-Stuff Uber-Oreo Cookies - or was it the Sweet Potato Samosas? Moral of this story: Errything I ate, I went back for elevenses. The Oreos got twelvesies. I think I ate that entire plate myself and left it rocking in its wake. I mean, of course I did. Oreos? Jenny? HELLLLO?? The cookbook itself is quite witty - and I totally love the fact that Charmian's personality really shines through. Each chapter is broken down into titles that captures what you're about to find; Crumbly, Drippy, Flaky, Smudgy. It's so fun. But please don't take my word for it. 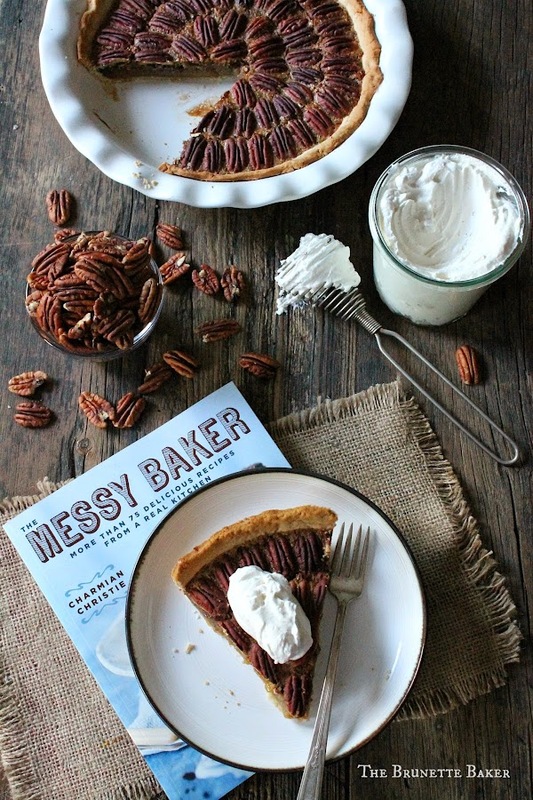 I'm giving away a copy of The Messy Baker, signed by Charmian herself to one lucky reader. Trust me folks, you WANT this in your cookbook arsenal. And please be sure to stop by and check out the other lip-smacking treats my fab foodie friends made for #MessyBakerMonday. Grab a napkin. Ya gonna need it for the drool. Open to Canadian and US readers only. Winner will be chosen on Monday, October 6, 2014. Disclaimer: I was sent a copy of The Messy Baker by HarperCollins to review. All opinions, views, and weight gain are all my own. Mmmm......looks perfect for Turkey day! Let me see....... Chocolate Sheet Cake!! Can't get enough!! I can't even imagine how good that pie tastes! I love it and would love to have a copy of that book for sure! I'm more of a 'clean as you go' baker. Weird. I know. but that 's a good quality to have in a small kitchen. It would be a Opera Cake! I'm dying to get my hands on a copy of this book. I hear there's a killer recipe for molasses cookies in it! Thanks for the lovely shout out and for hosting a giveaway. I’m beyond thrilled you like the book. This is one of my husband’s favourite recipes. We make it for his birthday. Oh such a hard question...I'd probably go with chocolate, in pretty much any form. This pie is stunning! Mmm, you had me at double-stuff uber-oreo cookies. Of course, I will never say no to pecan pie with fancy whipped cream!! Wish that I could devour a slice of this pecan pie right now, it looks so incredibly delicious and your photos aren't helping curb my cravings at all! Pinned! This is a seriously gorgeous pecan pie! :) Yum! Isn't the cookbook fabulous? I love how you can totally hear Charmian's voice in every recipe... it's like she's there walking you through it! And this pie... let's just talk about this pie for one minute.... droooooling! I know what I will be making for Thanksgiving dessert! Pumpkin Pie, for sure. This book looks so gorgeous. Jenny!! I loved meeting you this past weekend. . you are a true joy! I just read your About Me page and no I feel terrible for making you take a group photo. . anyway, you are such a fun person, bright light. . loved meeting you and love your energy, girl. OK, this pie is fabulous. . but you already know this. . and yes, I want to win this cookbook so I can have a little Crumbly, Drippy, Flaky and Smudgy in my life! One dessert? would have to be chocolate cake with chocolate frosting. . . with more chocolate frosting. I think I need to make this pie for Thanksgiving. Talk about YUM! !